About this object Serving a total of 10 terms in the House of Representatives, Andrew Volstead of Minnesota chaired the Judiciary Committee in the 66th and 67th Congresses (1919-1923). On this date, the 66th Congress (1919–1921) overrode President Woodrow Wilson’s veto of the National Prohibition Act. Known as the Volstead Act (H.R. 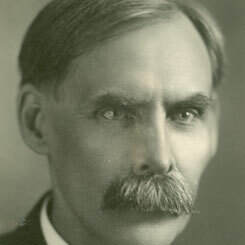 6810), after Judiciary Chairman Andrew Volstead of Minnesota, this law was introduced by the House to implement the Prohibition Amendment by defining the process and procedures for banning alcoholic beverages, as well as their production and distribution. When Volstead introduced an earlier version of the law (H.R. 3458) on May 27, 1919, Democrats countered with what would be known as the “wet law,” or repeal of the Wartime Prohibition. The battle between the “wets” and the “bone-drys,” as Prohibition supporters were known, ensued that summer in the House. In one debate, Chairman Volstead defended the act, stating “The American people have said that they do not want any liquor sold, and they have said it emphatically by passing almost unanimously the constitutional amendment.” With a Republican majority in the House, the law passed the chamber convincingly on July 22, 1919 with a vote 287 to 100. The Volstead Act remained in effect until the passage of the 21st Amendment, which repealed Prohibition in 1933.